Hello my wonderful Familia and Friends!!!! I love you all soo much and miss you too, but I am absolutely loving the misson and I haven't even gotten to La Yet! I was speechless... well actually I bawled a lot when I watched meg open her call! Papi is absolutely right nothing is coincidental. I am so excited for her!!! She will be an incredible missionary and we will be able to speak in Spanish to each other and the real kind too!!! Thank you for all the letters and support I truly have been so blessed to have you all in my life. So sunday me and Hna. Batista were asked to teach the lesson in District meeting... We thought we would have 2 hours to prepare, but we only got one. And then Hna. Batista had to go to a departure meeting since she was leaving the next morning so I was left to finish preparing on my own, but as I sat down they began to start the district meeting! They had changed the shcedule- immediate panis... a 1/2 prepared lesson and I was goint to have to teach it on my own... Well I said a prayer and off I went teaching a 40 minute lesson. I learned a powerfeul lesson. I was not the teacher, but the Holy Ghost was. If we are trying our best and doing what is asked of us God will help us through it. 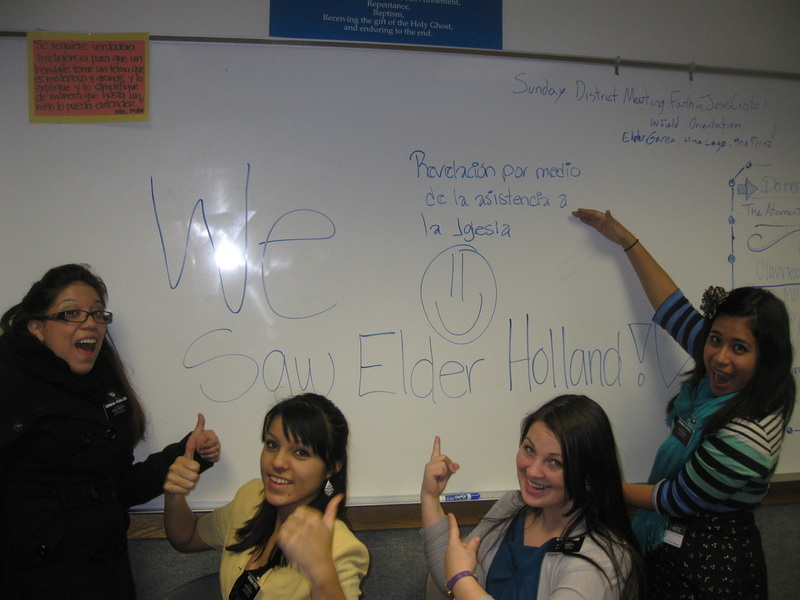 It was a good thing I learned that becuase not 5 minutes later the 2nd counselor of the branch presidency was letting me know I was talking in Sacrament meeting in 30 minutes- by the end of the day I knew I could do hard things and in Spanish too! So here in 17m we have a Fire alarm issue... Last week I was woken up at 4am by the fire alarm and shuffled outside. I had a cold and was so disoriented I forgot shoes! luckily they let us in the gym where we slept on the cold gound for an hour. Well tuesday morning at 12am the same thing happened. Except this time we all brought blankets, pillows, and got out the yoga matts. Needless to say I havent felt like I've gotten a reall good nights rest in awhile. Oh and the fire alarms werent serious they were because of new sprinklers in the basement going off or something. oh and I didnt catch that "flu" but that took out over 1/2 the mtc at once. When I got here it was like an infirmary. The missionaries however think it was food poining since it happened all at once and dissappeared in a day or two... who knows??? I'm just grateful I did'nt get it! So here in the MTC I have 2 progressive investigators- Jordan and Elvira (they are actually our teachers) I have been learning so much about teaching the Gospel and about people. It is so exciting to help people come to know their savior and show them how to find true happiness. Even through our investigators arent really investigoators the spirit is always real and very present. Elvira (who acually was one of our teachers real investigators) is very shy and has had such a hard life. I honeslty love this women even thou8gh I dont know her. How blessed am I that I get to spend the next 18 months loving and caring for people and teaching them about our Savior Jesus Christ and the love he offers! I am so grateful to be a missionary! it is the greatest thing in this world that I could be doing or that anyone could be doing. Missionaries come home sayint it was the best 18 months of their life (or 2 years) and I cant say that yet since Ive only begun, but I do know that a mission is the greatest thing you could do FOR your life! The future of Gods work depends on us- all of us. I urge you to reach out to others and share your testimony- everyone is in need of rescuing- share how the fullness of the Gospel changed your life and how it has blessed you. this gospel and the love of Christ is for everyone. I had the incredible opportunity to be in the choir- we sang "precious Savior, dear redeemer" it invited the spirit and testified of our savior. My favorite thing about choir is the director, brother Egget and the spirit he brings. He told the story of Mark 4 and how God will always rescue us in the right moment. He then testified that everyone is in need of Rescuing. I love the power of music! This is Real life! The realist it is ever going to get! The gospel might not get to everyone you are trying to teach, but it must get to at least one person and it BETTER BE YOU! It brought tears to my eyes when Elder Holland got teary eyed and talked about missionary work- I want to love my mission as much as he loved his "This means everything to me, everything that I have comes from this church. Everything I cherish is represented in the faces of you young missionaries." This gospel really means absolutely everything to me. I have my familia because of it- I am who I am because of it- and I am happy because of it. I am so incredibly grateful for Gods plan of happiness and his endless love, mercy, and gift of his son, Jesus Christ. I know I am going to change someone’s life and I know I am never going to be the same. I already feel like I have changed and continue to grow closer to the person God knows I can become. Elder Holland came to speak to us and dedicate 3 new building in the MTC. He blessed the MTC with complete protection - I have never felt safer. I am humbled to be part of the Hastening of the Lords work! There is no greater time then now to be a missionary! the 2nd coming has already begun and we are in the Middle of it! When the meeting ended we all sat in complete silence and reverence. We let the events of the last hour sink in. I stared straight at elder Holland and marveled at the presence and the spirit of God he carried with him. He sat very still at the close of the meeting seeming to take in the thousands of missionaries who hold the churches future in their hands- the future of Gods work. I am one of those hands... I know this apostle of the lord has complete love for us. He blew us a kiss with tears in his eyes and stood to leave. We rose and watched the Apostle of the Lord leave in complete reverence and respect. That man has changed so many lives- including mine. We basked in the spirit in that moment and no one spoke or moved until Elder Holland was long gone and one of the directors had to motion for us to leave. I am so grateful to have witnessed this and to feel of God’s love so strongly. I want everyone to be able to feel that- such love, hope, peace, gratitude, and courage. So that’s why I am here to share the blessings of the Gospel and bring others unto Christ. "I would be my brother’s keeper- Lord I would follow thee!"